Most folks visiting a brewery immediately recognize the large, round brew kettle that usually dominates the brewhouse. Somewhere nearby is usually a second, sometimes smaller, similar-looking vessel called a mash tun, and if the place is big and brews lagers, it has yet another one, called a lauter tun. These vessels are vented through stacks that carry the steam out of the brewhouse, consequently treating the whole neighborhood to the intoxicating, malty-sweet aroma of beer in the making. Traditionally, these vessels were made of copper and were often referred to simply as the coppers. Nowadays, the term has fallen out of use, mostly because modern brewing equipment is fabricated from the relatively cheaper and easier-to-obtain stainless steel. After the first three vessels are used, the beer is pumped (and cooled at the same time) into a big tank called a fermenter. For sanitation purposes, fermenters are usually airtight vessels that allow only for the escape of the carbon dioxide pressure built up inside. However, some traditionalists in the industry, particularly in Britain and Belgium, still allow their beer to ferment in open vessels, and some even encourage spontaneous fermentations caused by wild, airborne yeast (Belgian Lambic brewers, for example). Most breweries allow beer to go through a short aging process after the initial fermentation, using additional vessels cleverly named aging tanks for this purpose. Next, breweries transfer the aged beer from aging tanks into finishing tanks to prepare them for their introduction into society. 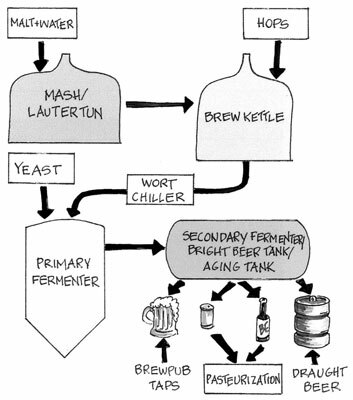 Brewers tend to use these tank terms loosely and interchangeably. Aging tanks are often called secondary fermentation tanks (because the primary fermentation took place in the previous tank); finishing tanks are alternatively called conditioning tanks by packaging breweries or serving, holding, or bright beer tanks by brewpubs (bright because the beer has clarified by this point). Because the beer must be regularly transferred from one vessel to another throughout the brewing and aging processes and because everything has to be super-clean, various pumps and hoses are scattered throughout the brewery, making some setups look like a Rube Goldberg device. Watch your step! So if you’re itching to start your own brewery, you’ll only need, oh, about a million dollars to get all the basic equipment.